Sir Everton DeCourcy Weekes, KCMG, GCM, OBE (born 26 February 1925) is a retired cricket player for the West Indies. Along with Frank Worrell and Clyde Walcott, he formed what was known as "The Three Ws" of West Indian cricket. He was born in Saint Michael, Barbados. 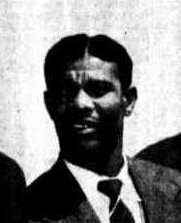 Weekes began his career in 1948. He scored 88 and 117 runs (retired) and was selected for the tour. He played his first match for Barbados on 24 February 1945. He was aged 19 years; it was one day before his 20th birthday. The match was against Trinidad and Tobago at Queen's Park Oval, Port of Spain. Batting at number six, he scored 0 and eight runs. Barbados lost by ten wickets. He retired in 1958. ↑ Cricket Archive, Trinidad v Barbados scorecard http://www.cricketarchive.co.uk/Archive/Scorecards/17/17467.html Accessed 24 April 2008. This page was last changed on 18 February 2016, at 09:50.